As Susan readied her school backpack Sunday night, she mentioned feeling anxious about their Monday morning concert. “What are you talking about it?” I asked. Although all the technology exists, there are so many calendars, schedules and websites to consult, things still manage to creep up on me. Mojo and I wanted to see whether our guitar lesson investments have paid off. We reorganized our morning and made it over to the Senior School in time to see the eleven Senior Ensembles play. 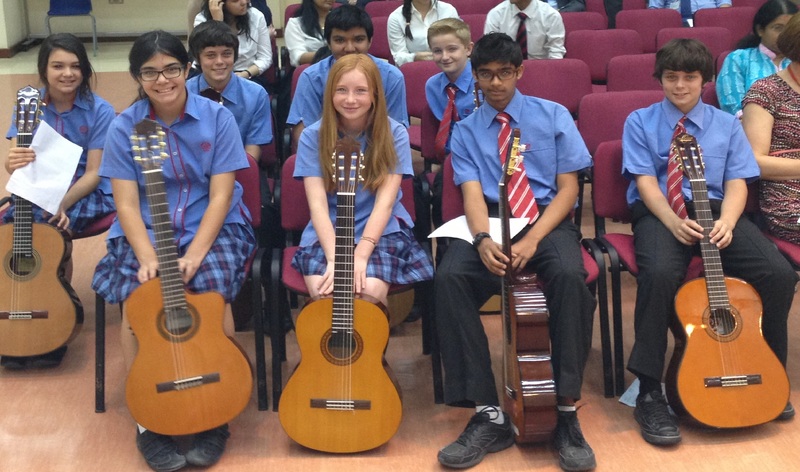 The ensembles ranged from classical flute and strings to rock and roll and were equally divided between St Christopher’s School and the British School of Bahrain. St Chris students are known for their success completing the British ABRMs’ programs. 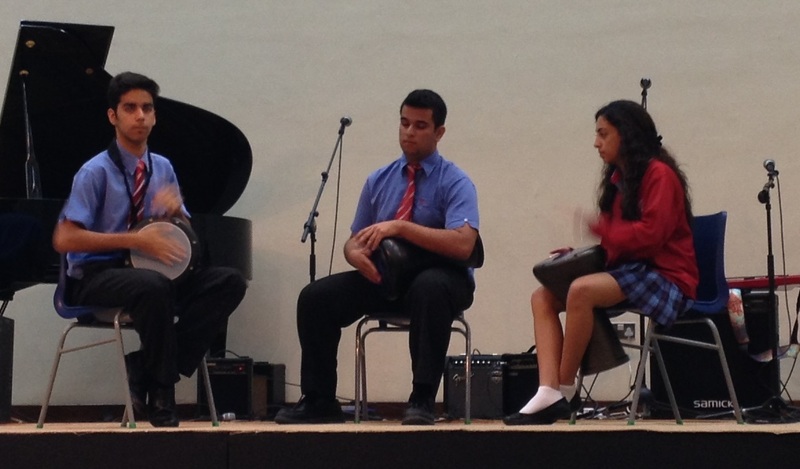 While BSB’s music program recently gained momentum on the international stage. James Arthur, the 2012 British X Factor winner, began his musical career at the British School of Bahrain. During the X Factor, he talked about his four, golden years of living in Bahrain. After his mother and step-father divorced, he and his mother moved back to the UK. Like many Third Culture Kids, their return to “regular life” was a shock, and he became difficult. His mother kicked him out of the house. He credits music to turning his life around and getting him off London’s streets. BSB is mentoring more, potential X Factor stars including Gershom, the young man with over-sized Ray Bans, who sang and accompanied every group on either the guitar or the piano. Under Lydia Martin’s musical leadership, BSB played songs by White Stripes, Swedish House Mafia, FM Static and Luminate. Each ensemble also had a catchy name: Against the Tide, 50/50, Noise Pollution, Ehsan and the Rest, and The Getaway. 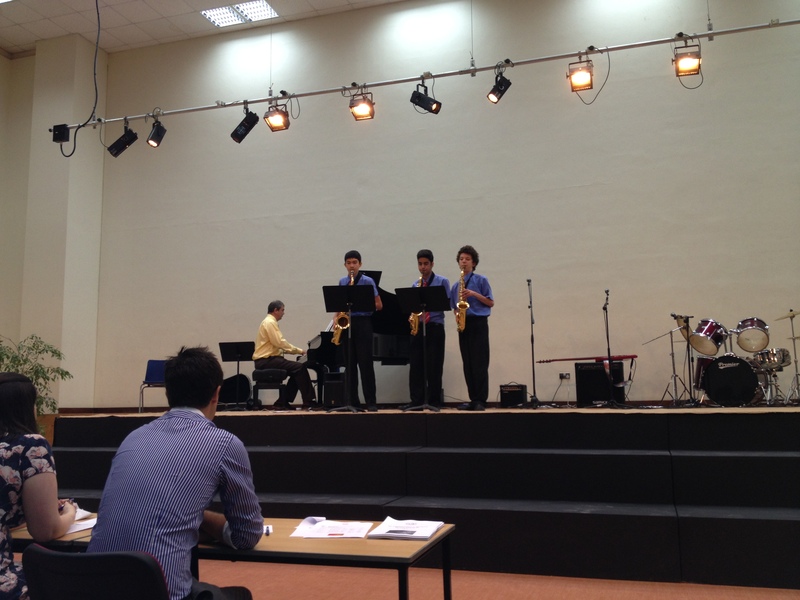 On the other hand, St Chris’ ensemble entrants performed as Senior Flutes, String Trio and Saxophone Ensemble covering a range from Haydn, Gershwin, as well as traditional English and Arabic pieces. The closest thing to a rock band was the guitar ensemble who played Coldplay’s Paradise. Our whole clan was part of the Paradise performance. Mark happily surprised us playing a lead part. 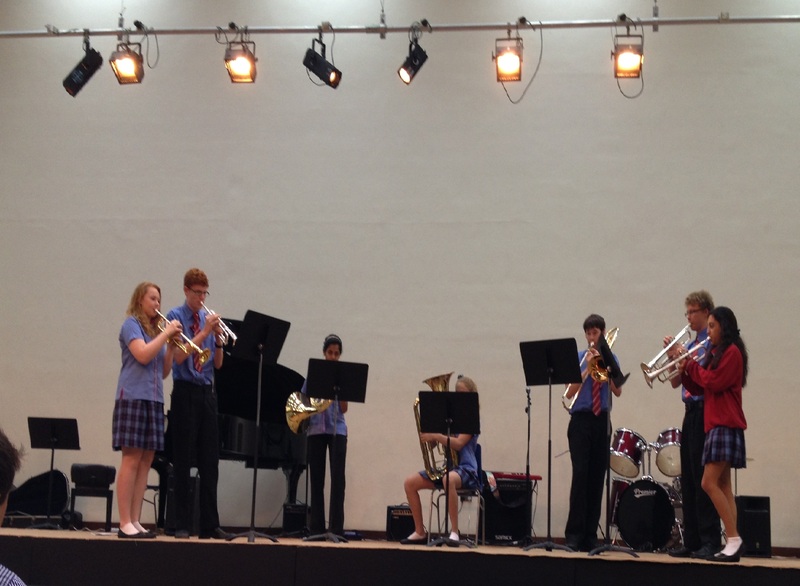 Although, we got a kick out of the St Chris’ brass ensemble’s rendition of the 1976 Muppet Show theme song, admittedly, BSB’s pop and rock numbers were crowd pleasers and had the audience clapping and snapping photos. After the eleven groups played, the two adjudicators put their heads together. I wondered how they would view the different song choices. They said, “We looked at little things like ‘communications between the group’ and ‘looking at the audience’. 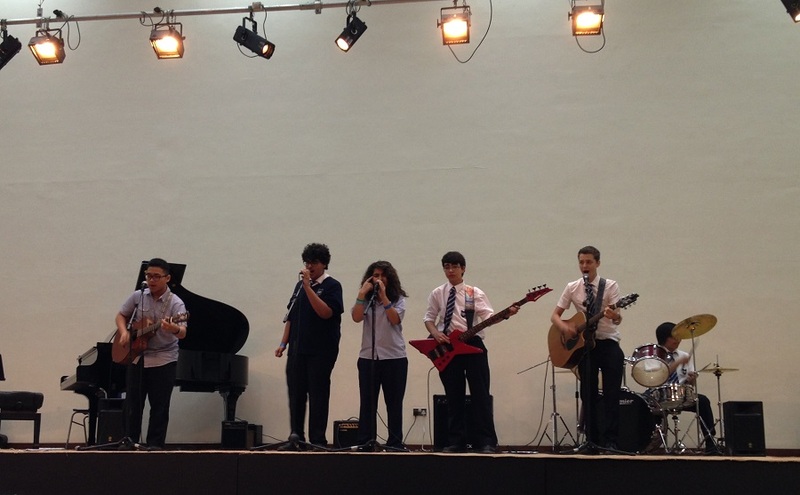 Gershom, Yannis, Daniel, Paul and Saiyf, also known as BSB’s Noise Pollution, for their original song, Ocean Wave. Second place was a tie between St Christopher’s Arabic Drummers and Arnold Brass. The four ensemble finalists along with the finalists from the other twelve categories will be playing Wednesday at 2:30 at St Christopher’s Junior School. Come and see the new generation of X-Factor contestants. Each year St Christopher’s School hosts three music festivals plus several musical productions. The Music Festival open to schools in Bahrain has started and leads into next month’s Young Musicians of the Gulf which is an international competition. This year’s participants include the British School of Bahrain under Lydia Martin, Nadeen School, Sacred Heart, Al Hekma, the Japanese School, New Millennium School, AMA International School, Amna Bint Wahab School, Ibn Khuldoon and Hidd Secondary Girls’ School are all participating. There are 233 entries grouped by Junior and Senior Ensembles, Instrumental, Vocal and Piano. At the conclusion of each category’s performances, the winners are named. The Grand Finale takes place this Wednesday at 2:30pm at St Christopher’s Junior School in Sar. “Mysticism and poetry have always been important elements in Islamic cultures. This has been the case throughout the centuries. 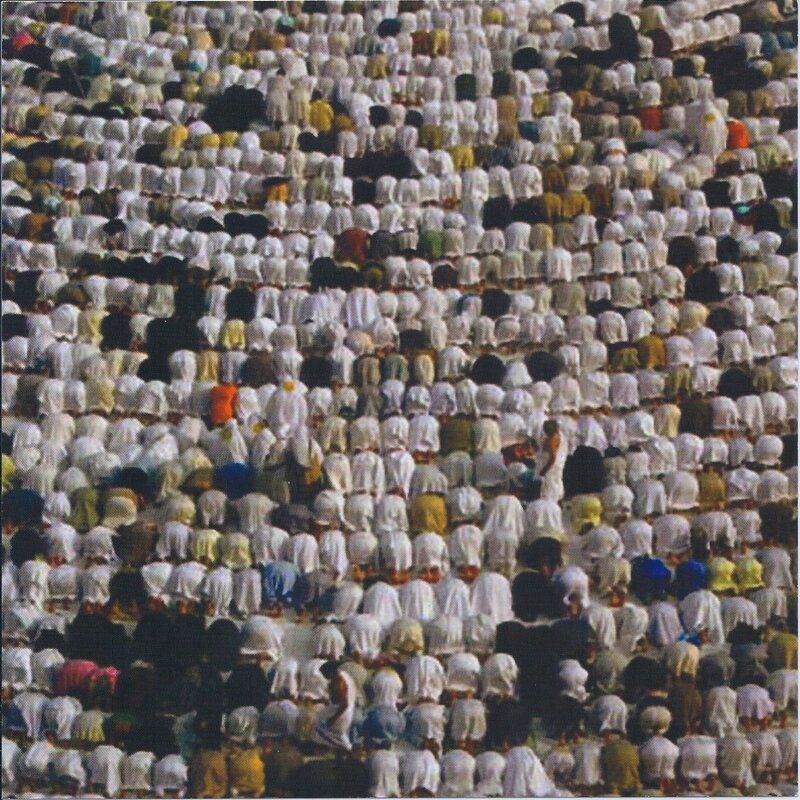 The Muslim world is not composed of a single color. And it is not static at all. It is a tapestry of multiple colors and patterns. Sufism is not an ancient, bygone heritage. It is a living, breathing philosophy of life. It is applicable to the modern day. It teaches us to look within and transform ourselves, to diminish our egos. There are more and more people, especially women, artists, musicians and so on, who are deeply interested in this culture.” – Elif Shafak, author of The Forty Rules of Love. Fareed Ayaz and his eight member party will be performing a Qawwali concert to open the Jamshid Bayrami exhibit at La Fontaine. Listening to the hypnotic songs which typically last from fifteen to thirty minutes may be a new experience for the modern pop music listener, but Qawwali music is not new. It is a 600-year old Sufi devotional music. In the West, the best known Qawwali musician was the late Nusrat Fateh Ali Khan. Peter Gabriel’s Real World label released five albums of his music. In film, his contributions were included in The Last Temptation of Christ, Natural Born Killers, and Eat, Pray, Love. Since the 1997 death of Nusrat Fateh Ali Khan, Fareed Ayaz’s party has continued to spread Qawwali music worldwide, winning numerous awards and playing for global audiences. Fareed Ayaz’s eight member party comes to Bahrain under the support of the Paris-based Theatre de la Ville. Through Theatre de la Ville’s long list of Pakistani, Indian and African performers, Western audiences have been introduced to new norms. 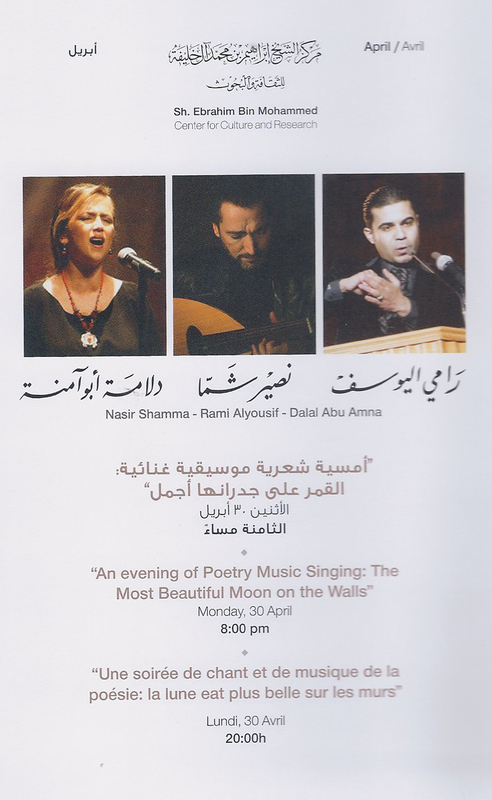 The concert is in conjunction with the opening of Iranian photographer Jamshid Bayrami’s exhibit, Haj Harmony. A photojournalist, Bayrami has covered the Iran-Iraq war and Middle East politics for The Economist, Time, and Agence France Presse. He won the Grand Prize at the Fajr Festival and a UNESCO World Prize for photography. He is represented by the London gallery Xerxes Art. The exhibit opening and concert will be this Friday, May 25th at 7pm at La Fontaine Center for Contemporary Art. The exhibition and concert will be 25bd and if you include dinner around the fountain, the cost is 35bd. Monday, 30 April at 8pm. Sheikh Ebrahim Center in Muharraq Bahrain. Post mortem. I hope someone remembered to go see this.